The story of those who make all stories possible is a simple one of every moment’s struggle. The around 3000 workers in Maruti Suzuki in Manesar, Haryana, more than half of whom are hired on contract, are extremely angry, and this collective anger is one of the most lethal arms that they possess. It arises from discontent of the unending days and nights of alienated labour, reduced to being mere parts of the machine, torn from his fellow workers by the attack on the right to organise. The worker lives and bleeds to death, faces insults and feels fatigue, thirsts for water and suppresses his urine, all this, only so that the assembly line goes on. In this nerve centre of the automobile industry, the Plot no.1, Phase 3A of the Industrial Model Town Manesar, a Swift and an SX4 model car is assembled in 38 seconds. 1250 squeezed out per day. Super-profits of the bosses. Efficiency. Development. Growth. Consumer satisfaction. A ‘happy’ middle class family. Maruti Suzuki Industries Ltd., the biggest automobile company in India with a passenger car market share of over 45%, promises a “way of life”. For this, it spent a reported Rs. 2000 crores on advertisement alone in a year (so the bent-back welcome to its lies from Wall Street Journal to all the so-called objective corporate media in India). As its profits soar in geometric progression, its financial statement says it spent a mere 1.9% as total employee cost in the year 2010-11, down from 3.5% in 2001 and 2.3% in 2008. When in June this year, the young workers all in their 20s, demanded their right to organise, and filed for Union registration on 3rd June, the company sent its ‘bouncers’ to literally arm-twist the workers into signing a blank sheet of paper to give up their demand for this minimum of respect. The workers struck work on June 4th and continued a sit-in inside the factory for 13 days till June 16th. The suspension of 11 workers was revoked. Made to cower down momentarily in face of the workers’ fight, the company, with blood on its hands from crushing the workers movement in early 2000 in its Gurgaon plant, plotted revenge and Shinzo Nakanashi, the MD threatened that workers must be “educated”. Cockroaches and dead flies begun to be found in the food in the hurried lunch-break of 30 minutes that workers earn in the canteen ½ km from the working station. The tea was without tea leaves or sugar in the 7 minute break, as workers would go to the bathroom running with a snack in the mouth, tea cup in one hand, unzipping with the other hand, before the bell rings and the assembly line resumes. The company doctor would give heavy doses of ‘instant’ medicines even on any minor complaint by a worker, only so that disruption of work could be prevented. The disease then returns in greater degree and one day’s wage cut of Rs.1500, two days Rs.2200, three days cut of Rs.7-8000 is implemented, so that almost the total month’s wage is cut. One second late into punching-card entry is a day’s wage cut, but he cannot then go out of the factory but has to give his full production for that day too. Meanwhile, with ‘development’, ‘growth’, ‘consumer satisfaction’ involved, the willing State too lends its full support (rejecting the minimum demand for registration of the workers’ Maruti Suzuki Employees Union (MSEU) as a pre-independence day gift on 14th August; police force of 500 send to occupy the factory to ‘prevent violent activities’ as a pre-emptive measure on August 28th night). The company then terminated 11 workers and suspended 38 on August 29th and 30th on false charges demanding a ‘good-conduct bond’ (read: humiliation by law), with the state police and administration, the media (which is singing the management’s tune that production has resumed), and ‘bouncers’ on its payroll as its willing pawns. Inside the factory, with cameras even in the bathrooms, the company’s evidence-less charges of ‘indiscipline’ and ‘sabotage’ or go-slow in production are baseless. Is it remembering the death penalty for ‘industrial sabotage’ implemented in an emerging industrial England with the 1812 ‘frame breaking act’, that corporations clamour for more ‘solid’ laws? The language now is ‘flexible’ labour laws for a more insecure and ‘mobile’ labour force. In fact, contractualisation of labour is fast becoming the definitive burning issue before the working class. The workers, both permanent and contract, in Maruti Suzuki however stand united in this struggle. In such a situation, the current demand of the recognition of a Union that the workers feel represents their interests becomes the first step towards demanding the end of such despicable working conditions and back breaking extraction of labour which make profit and strength of the company possible in the first place. The Maruti Suzuki Employees Union (MSEU) is demanding as an immediate measure, the withdrawal of the charge-sheet, termination, suspension of the 49 workers. The workers are sitting day-and-night at the factory gate, peeling off the layers of Maruti Suzuki’s “way of life”. The significance of the current struggle in Maruti Suzuki’s assembly plant where workers anger and corporate-state power battle, can only be fully comprehended in view of its impact in the vast network of arteries of the industry in the area and beyond of which Maruti sits at the centre, exhausting a low paid, ‘mobile’ workforce with the normalcy of exploitation. On 1st Sept, on the call of the MSEU, in solidarity with all the workers of MSIL, Manesar, over 5000 workers assembled at the factory gate no.1 for a dynamic gate meeting and juloos that followed in the IMT Manesar area. On the 5th September again, around 4000 workers rallied till the highway to block it. The Gurgaon-Manesar-Dharuhera-Bawal industrial belt in Haryana is stirring up in solidarity and protest by workers and Unions in the area. The social power of these young workers is tangible with the thunderous camaraderie that erupts when workers and others join in solidarity. This struggle erupts as a continuation of rising tide of workers` struggles in Gurgaon-Manesar with the most prominent being the police attack on a demonstration of Honda (HMSI) workers in July 2005. In May 2006, immediately after a five day occupation at Hero Honda by 3,000 contract workers, tools were laid down in the supplying plant of Shivam Autotech. Similar situations at HMSI and Delphi have also arisen after that. The Rico Auto 43-day strike happened in September 2009 with one lakh workers in the area going on a one-day general strike which shook not only the entire area but stopped production lines in General Motors in the US. This present struggle thus, more than itself, is important in the possibilities it shows ahead for working class struggle and the struggle of the masses in crisis. We know and realise even better with the ongoing struggle in Maruti that profit depends on one most significant variable- exploitation of working people. This is true from POSCO Orissa to Maruti Manesar, where the potentiality of the masses is violently disrupted on one hand by displacement and uprootedness, and then boxed up in daily routines, shift rhythms and distorted social relations. We realise that exploitation is not an event or a spectacle but married to how ‘normalcy’ is produced. As young women and men faced with the crisis of the system as it stands, we realise that this and other such struggles of the workers and masses expose the skeletons on which the grand houses of riches are built. As a youth organisation, Krantikari Naujawan Sabha, seeks to expose the limitations of the present system from a left revolutionary perspective, seeking a living political process. Rather than ending up ‘interpreting’ Marx’s 11th thesis “Philosophers have only interpreted the world so far. The point however is to change it”, a direction is sought towards really changing the world. 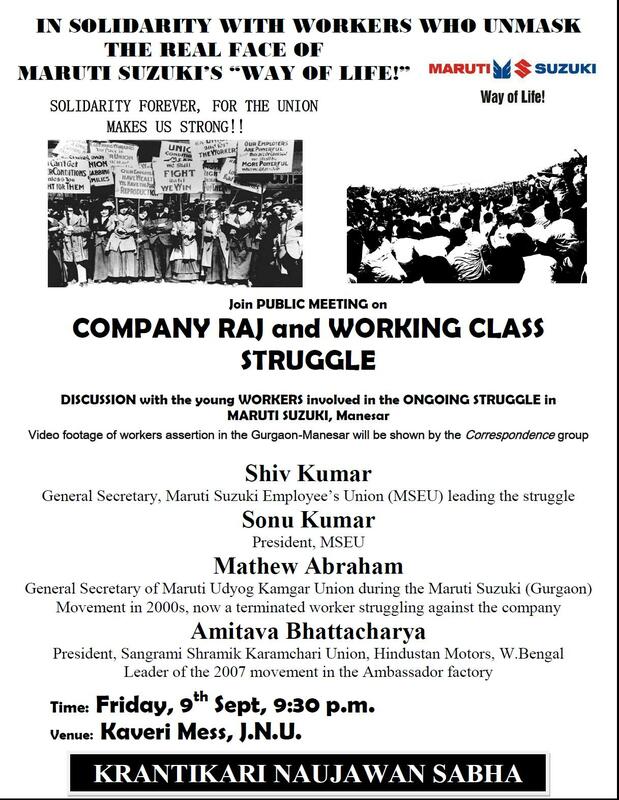 With the struggle in Maruti Suzuki, we stand as part of the larger solidarity effort and forum which is in coordination with the Union’s effort. We call upon all to join us in the solidarity meeting with the struggling workers in Kaveri mess, JNU, tonight 9th September at 9.30pm.